Lend some colorful accents to your surroundings with the beautiful plant of Bougainvillea Bonsai. It is a tropical plant that comes in several colors like orange, bright red, white, purple and pink. Originated in South America and native to Peru, Brazil, and Colombia, it is considered as a subtropical species that is known for its large-sized flowers. Their branches resemble that of a vine and can be pruned into Bonsai. This plant has a beautiful display of flowers with an interesting branch structure and a thick trunk. Depending upon their species, Bougainvillea Bonsai can be grown against a fence, in the containers, as hedge, ground cover, in tree form, and more. Bougainvillea Bonsai plants are not different from Bougainvillea Vines. But if you want to grow a Bougainvillea Bonsai, you need to start by selecting a good container with excellent drainage. Purchase a small Bougainvillea in springtime. Keep the plant in a small container, brush the soil from its roots, and prune one-third of its roots. Now prepare a growing medium with equal parts of perlite, pine bark, peat moss, and potting soil. Add the medium in the one-third of the container and keep the plant into its center. Tamp the soil down firmly and stop an inch below as you are about the rim. Once you have planted, it will require sunlight to thrive all day long. Always keep the plant where the temperature is above 40 degrees. Make sure that you prune the plant during the growing season and do shape the plant to enhance its center trunk. Bougainvillea Bonsai also grow their best when the weather is warm. Bougainvillea Bonsai care is as important as correct planting. Here are the care instructions to follow to make your Bougainvillea Bonsai grow its best. If this plant does not get enough amount of sun, it will not show its full colors and hues. Bougainvillea Bonsai comes from the USDA zones 9B-11 and does not grows below 30 degrees Fahrenheit. This plant cannot withstand freeze; especially the newly planted ones. The care of Bougainvillea Bonsai includes trimming at regular intervals. You can trim the foliage at any time of the year, but make sure that you do not trim off the bracts when they have started to gain the color. Whenever you style the Bonsai plant, you need to take care of the special areas like canopies, form pads, and long sweeping limbs. Bougainvillea Bonsai prefers deep watering, i.e. regular watering every three to four weeks. Whenever you plant a Bougainvillea, make sure that you water it regularly, and the soil is damp as well. It is essential that you choose an ideal container for your Bonsai. Look for a round or a rectangular pot that goes with the shape of your plant. However, the round pot should be 1/3rd of your plant’s height, and the rectangular one should be 2/3rd of it. Irrespective of the fact, whether you are planting it inside or outside, the depth of the container should also be equal to the diameter of the plant. Bougainvillea Bonsai prefer a fair amount of organic matter in the soil. The soil that you use should at least contain 40% of it. However, the inorganic part of the soil should consist of coarse sand, agricultural pumice, decomposed granite, or different portions of all the above. This plant is mostly pest free, but they are somewhat vulnerable to aphids and a bit of black spot fungus. During the spring, low nitrogen fertilizer should be used in the plant. The plant will have more blooming if the content of potassium is more than the Nitrogen in it. You can also make the soil acidic by adding the azalea fertilizer to it. Out of all the tropical species used for Bonsai, Bougainvillea will grow and will give you one of the most impressive displays for your home decor. How to grow and care for Juniper bonsai? Did you know that one of the most popular Bonsai trees available is the Juniper Bonsai Tree? Native to Middle East, Asia, India, Europe, North America, and South America, Juniper Bonsai is the member of Cypress family and have about 170 species. They belong to the category of hardy plants and can also be found in a variety of temperatures, except for the places with extreme cold and heat. Small Juniper: Small Junipers Bonsai grows up to 6 feet. Ground Cover Juniper: These Junipers Bonsai grow up to 1 ½ tall and are best for gardens, ground cover, border edging, and more. Large Juniper: Large Junipers Bonsai grow up to 25 feet. How To Grow Juniper Bonsai? Juniper Bonsai is easy to grow and a low maintenance plant. To grow Juniper Bonsai, dig a hole twice as the size of the root ball. Mix some rich compost and then remove the rooted plant from the container. Set the plants in a hole and spread the outer roots a little. Tamp down the soil, fill in the hole, and water 2-3 times for a couple of weeks. Keep the weeds down and add the additional fertilizer if the overall quality of the soil is poor. Moreover, you should grow your Juniper Bonsai in a location where it can receive more than 4 hours of sunlight every day. This plant can also withstand both drought and dry soil conditions. However, you need to remember that growing Juniper Bonsai in containers will retard their growth. They grow much better in the regular garden soil. But in case, if you grow them in pots, the plant under the age of 10 years should be repotted every two years. Those plants over the age of 10 years should be re-potted every four years. When To Grow Juniper Bonsai? The best time to sow the Juniper Bonsai seeds is autumn. Whenever you sow a seed in autumn, the seedling has full summers to grow once it starts to germinate in early spring. The Juniper Bonsai Trees are easiest to care for, and also serve as an excellent choice for the one who is new to the world of Juniper Bonsai. Moreover, with the just right amount of humidity, light, and water, this plant can thrive in any conditions. Care of Juniper Bonsai might seem difficult at first, but here are few guidelines that will help you to take care of Juniper Bonsai with ease. Position: Place the tree outside around the year and on a bright spot where it can get lots of sunlight. Soil Requirements: You can use a commercially prepared soil for Juniper Bonsai. You can also use your own soil or use a suitable potting mix that has equal parts of sand, clay, perlite and ground pine bark. To improve the soil drainage, you can mix stones, rocks, and other large particles in the soil. 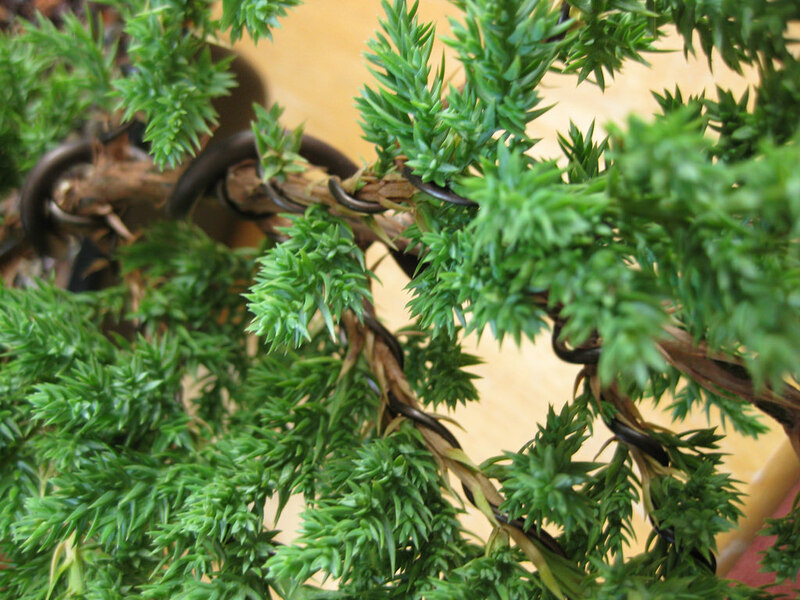 Watering: The Juniper Bonsai roots don’t prefer soil wetness so be careful that you don’t water this plant much. However, you need to mist the tree regularly, especially after the tree has been repotted. Wiring: Junipers should be heavily wired when they are young. They look their best with the twisted shapes, but you should wrap them for extra protection. Pruning: Pruning a plant means to trim the ground parts, but with a Juniper Bonsai plant, you also need to prune its roots as well. And pruning should be done regularly to maintain the shape and health of the plant. You can also wire them to shape them in the desired pattern. For Propagation: Use its seeds and cuttings. Apart from following the above guidelines, look for the mites and pests on your plant. If you spot any of them, rinse the foliage with warm water or spray a mild insecticide for three weeks. Moreover, it is important that you don’t let the foliage pads get dense as pests settle more easily on wet plants. Aralias make unique houseplants. They find varied uses in homes and gardens. Available in varied heights, the plants can fit into most interior spaces and sit in different positions indoors. The different plants under the genus mean there’s a specific plant form for every homeowner. The plant can also be used in various forms in the home setting. Unlike most houseplants, Aralias are aesthetically beautiful and can create a focal point indoors in natural-themed interior spaces. The plants are increasingly being used indoors due to their successful application in high-end in home interiors. What’s more, they thrive in conditions unsuitable for most houseplants. Also known as Spikenard, Aralias belong to the Araliaceae family. It comprises about 70 plant species. They come in the form of evergreen and deciduous plants, trees and even shrubs. Some varieties are also herbaceous perennials with rhizomatous rooting systems. The plants are native to the Americas, Asia, and regions with mountain woodlands. Varied in sizes, some Aralia cultivars grow up to 20 meters high while others barely hit half a meter in height. Most Aralia species are superior houseplants with great capability to adapt to conditions indoors. They have unmatched ‘staying power’ in home interiors even when grown in hot, dark places. The plants have been on and off gardeners’ list of favorite plants over the last many years. International botanicals have grown Aralias for years to come up with the best cultivars for home interiors. They diversified the forms and sizes of the plants. The plants come in varied colors and leaf forms. Ming aralia feature elegant, lacy leaves while the chicken gizzard has spherical leaflets. ‘Dinner plate’ aralia feature large, aptly leaves while ‘spinach leaf’ aralia have dark, tightly-crinkled leaves. Aralia leaves, petioles and general foliage range in color from cream and gold to solid green and white. Others come in dark-green, almost black to burgundy hues. Aralias sweeping, curving branches; massively woody trunks; and shaggy, heavily-dense foliage make them stand out in home interiors as houseplants. They find use indoors as large or small plants. The plants can be grown as ‘bonsai’ plants in 6-inch or 8-inch pots. Use them to accentuate reception counters in offices or table tops in homes with their attractive colors and shapes. Certain varieties that grow up to 4 feet tall can fit in 10-inch pots. Stump or bush plants that grow up to 3 to 6 feet in height can comfortably fit in 14-inch pots for indoor use. However, varieties that range in height from 7 to 12 feet fit 17-inch to 21-inch pots. The large Aralia plants are suitable for placement in entryways and other places indoors with lots of open spaces. The kind of care Aralia plants receive in nurseries determines their successful growth indoors. Aralias thrive in light, well-drained soils with proper drainage. The plants require sufficient watering for optimal growth. The amount of light the plants can access indoors determines the level and frequency of watering and applying fertilizers. Although it’s recommended for soils to be kept moist, some gardeners report that the plants thrive in dry soils. If the amount of light available is low, water the plants at least once every three weeks. Avoid overwatering to prevent the development of plant diseases such as root rot. Opt for sub-irrigation or a controlled watering device for efficient Aralia watering. With proper care and growth conditions, the plants can successfully grow indoors for a minimum of a decade. Unlike most houseplants, Aralias can be pruned to foster new foliage growth and maintain their lush look. Granular fertilizer rich in nitrogen is recommended. Some Aralias can be costly during initial planting stages and growth. However, it rewards gardeners and homeowners with a long lifespan as long as they’re accorded proper care and placed in locations with all the growth requirements. Just like Feng Shui, a plant popular for its energy, love and calmness flow, Aralia Fabian offers similar benefits. Also known as Plum Aralia, it’s a shrub tree with maroon leaves that tend to be purplish on the undersides. The shiny leaves range in size from large to medium. The round leaves are deeply veined. Although the plant’s flower in the wild, cultivated cultivars rarely bloom. Aralias grow upright as columnar plants in containers, making them ideal houseplants. Potted Aralia Fabians make perfect housewarming gifts. Also known as Aralia ‘Chicken Gizzard’, the plant has leaves similar in shape to chicken gizzards. It features branches with spherical leaflets with at least two lobes. Just like Aralia Fabian, it grows a columnar plant. Its leaves are uniquely-shaped, which, together with the plant’s distinct growth stature, are bound to improve an existing interior décor. Unlike other houseplants, they’re more costly due to the time and care they require to grow. They’re worth each cent spent on them. Aralia Balfouriana is a beautiful, potted floor plant. Some species boast large, shiny, dark-green leaves while others feature crinkled leaves with deep veins. The leaves are waxy on the surface and lobed. The container plant grows upright and less wide than the pot housing it. Wilting from overwatering – leaves drop if the plant is excessively wet. Extremely hot or cold temperatures also result in dropping of leaves. Aralia Leaf Drop – Low humidity indoors or dry air conditions causes leaves to drop. Weak / Over-grown Limbs – Aralias require lots of light to grow. Insufficient lighting conditions lead to weak, stretched plant growth. Prune in spring to foster plant growth and fill spots without foliage. Leaves with Brown Edges – Excess fertilization and low humidity levels result in browning of leaf edges. Exposure to air dries the leaves, leading to the browning of their edges. Insect Pests – Aralias are prone to spider mites, aphids, and scale. Use natural pest control solutions such as neem oil to eliminate Aralia pests. Aralia plants can be grown indoors or outdoors. With proper care and maintenance, the plants can grow successfully for many years. They require proper watering, fertilization, soil, and lighting conditions to grow optimally. Do you want to grow Aralia in your home or office? Contact us to find out more on how to grow Aralia plants in pots or grow bags.